Leading Manufacturer of dip pretreatment plant from Pune. By utilizing skills of our experienced professionals, we are manufacturing, exporting & supplying a comprehensive assortment of Dip Pretreatment Plant. This unique product is manufactured by professionals employing pristine-grade material and leading-edge technology. Owing to its quality features like strong design, excellent performance and easy installation, this product is widely acknowledged by our clients from every nook & corner of the world. The offered product is made available in a range of customized options. These pre-treatment systems are used for the industrial purposes for cleaning & coating of metal rather than paint on the material, work piece, tools, equipments etc. 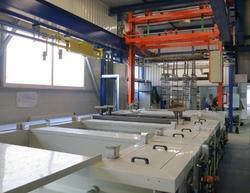 Looking for Dip Pretreatment Plant ?